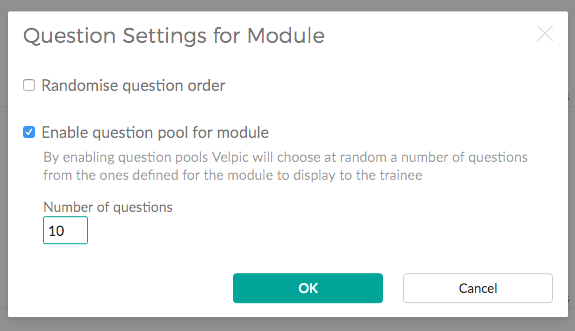 By turning on question pools, Velpic will choose a random number of questions from the questions you've defined for a module to present to each trainee completing the lesson. Note: Currently question pools are only available for use with Module lessons. 2. Go to the assessment view. 5. On the settings view, check the "Enable Question Pool" option and select the number of questions you want to appear to the user. 6. You can also randomise the question order by selecting that option in the question settings page. 7. When you preview the lesson, the questions will be generated each time to show you what the trainee may see when they complete the lesson!